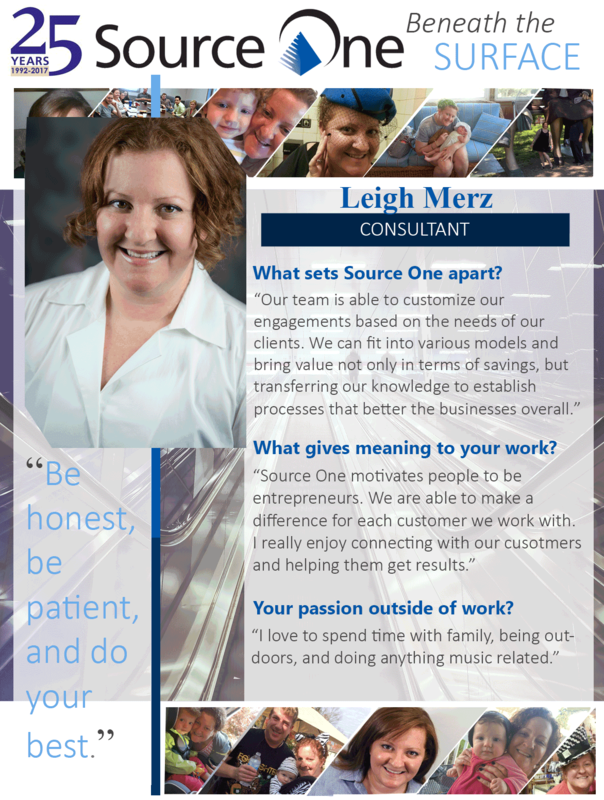 Home Featured Source One News Beneath the Surface: Meet Source One Consultant, Leigh! Beneath the Surface: Meet Source One Consultant, Leigh! As a part of Source One’s continued 25th Anniversary celebration, today, our Beneath the Surface Employee Spotlight series commemorates none other than Leigh Merz! As a Source One veteran, Leigh has served Source One for more than a decade as a consultant focused in Telecomm SME. Leigh’s role frequently has her highly involved with clients, discerning the complex nature of the Telecom industry – between deciphering complicated contracts, negotiating renewals and terms, conducting in-depth data collection, to baselining and going to market, Leigh has been at the forefront of serving small and medium businesses, using her years of experience to leverage opportunities and deliver value to clients. Outside the office, as a New Jersey native, Leigh is passionate about New York City and fashion. In her free time, she collects fun hats, memorizes film quotes, and loves to spend time with her daughter. To learn more about Leigh, check her out below in the Beneath the Surface Spotlight Series!